Eat to Live: The Amazing Nutrient-Rich Program for Fast and Sustained Weight Loss. 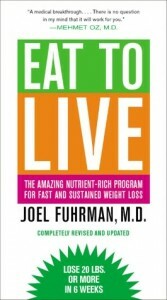 The first Eat To Live book was published in 2003 and was recently revised for the 2011 edition. This new version now provides proof in the form of updates from the scientific research that was carried out to support the author Dr. Joel Fuhrman’s six-week ‘diet’ plan. It is important that you noticed that I put the word diet in quotations in the previous sentence. This is because this plan is more of a lifestyle change than the traditional diets that we have been exposed to in the past. In the new chapter, he explores toxic hunger and how it contributes to people being addicted to food. You really get to dig deep into the what causes you to gain weight. Basically you can induce what he calls toxic hunger when you eat the wrong type of foods, and Dr Furhman shows you why this happens. Toxic hunger is responsible for making people consume more calories than they require. What I really enjoyed was reading about how to fight any cravings or addictions caused by toxic hunger to the junk foods that we should be avoiding anyway. You can use the information contained in this book to help you live a longer and healthier life. You should also be able to stop relying on medication. He’s goal is to try help you change the way you eat for life and not just for a couple of days or weeks. This book opened my eyes to what I have been consuming. Some of the foods I should be eating that were missing from my diet as well as how certain foods were harmful to my health. Who is Dr Joel Fuhrman M.D.? Well although he is now most commonly known as a best-selling author, he is also family doctor that is fully certified by the medical board. He has also been involved in research that is centered around prevention and reversal of diseases using natural methods, that include nutrition too. He has been featured on many radio and TV shows, including CNN and Dr. OZ as an expert on nutrition and natural cures. He has written a total of 7 nutrition books so far. What I like about his plan is that there are no strict rules. You have a choice between a week of meals for vegetarians or a week for those who do not want to take on the vegetarian meal plan. His meal plans are based on actual science.This is a a life changing book, especially useful to those who are obese, who suffer from high blood pressure or are a diabetic. You will learn how to eat properly from now on. Healthy Beef Cookbook: Steaks, Salads, Stir-fry, and More – Over 130 Luscious Lean Beef Recipes for Every Occasion : A delicious and nutritious way to add zinc, iron and protein-zip to a salad is to add some beef tenderloin. Not only is beef tenderloin an excellent or good source of nine essential nutrients, but it is also one of 29 lean cuts of beef. Nutrient-rich lean beef is a complete recipe for better health, with essential vitamins and minerals and great taste. 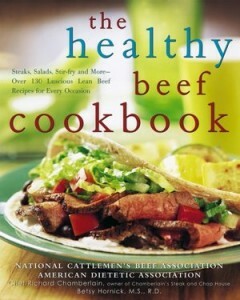 To help you prepare delicious lean beef, “The Healthy Beef Cookbook” is now available wherever books are sold and on www.amazon.com and www.BeefItsWhatsForDinner.com. The cookbook is a collection of more than 130 lean beef recipes, nutrition tips and culinary techniques. The delicious recipes are satisfying for people watching their weight and contain many essential nutrients in fewer calories. In fact, nearly 75 percent have less than 400 calories per serving and more than 50 percent incorporate all food groups. 1. Season beef steaks with 1/2 teaspoon pepper. Heat large nonstick skillet over medium heat until hot. Place steaks in skillet; cook 7 to 9 minutes for medium rare to medium doneness, turning occasionally. 2. Meanwhile, whisk Honey Mustard Dressing ingredients in small bowl until well-blended. Set aside. Divide greens evenly among 4 plates. Top evenly with pear wedges and dried cranberries. 3. Carve steaks into thin slices; season with salt as desired. Divide steak slices evenly over salads. Top each salad evenly with dressing, pecans and goat cheese, if desired. Nutrition information per serving: 321 calories; 14 g fat (3 g saturated fat; 7 g monounsaturated fat); 67 mg cholesterol; 434 mg sodium; 21 g carbohydrate; 3.3 g fiber; 26 g protein; 7.6 mg niacin; 0.6 mg vitamin B6; 1.4 mcg vitamin B12; 2.4 mg iron; 30.0 mcg selenium; 5.1 mg zinc. Fix It And Enjoy It Cookbook : Many cookbooks these days are long on dazzle and flash, and short on good recipes that we can instantly trust and love. New York Times best-selling author Phyllis Pellman Good gives us recipes that include ingredients we already have on hand or can easily buy-recipes that are easy, foolproof and will make our families smile. 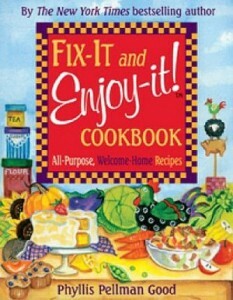 Good’s series of slow-cooker cookbooks, “Fix-It and Forget-It,” sold more than 6 million copies! Now, her new “Fix-It and Enjoy-It! Cookbook” (Good Books, $15.95) offers readers even more tried-and-true, welcome-home recipes for stovetop and oven cooking. A collection of more than 675 recipes submitted by at-home cooks from around the country, the “Fix-It and Enjoy-It! Cookbook” features mouthwatering favorites such as “10-Minute Meatloaf” and “Frozen Mocha Cheesecake.” Each recipe includes its prep and cooking times. On a lightly floured surface, roll the thawed puff pastry to a 10″ x 18″ rectangle. Place rectangle of pastry on a lightly greased, large baking sheet. In a medium-sized bowl, stir together cheese, sour cream, onion, shrimp and half the beaten egg (about 2 tablespoons). Spread the mixture length-wise down half of the rectangle. Brush edges of pastry (using pastry brush) with some of the remaining beaten egg. Carefully fold dough over the filling and seal edges with the tines of a fork. Brush top and sides of strudel with remaining egg. Remove from oven and cool 20 minutes before slicing. With a very sharp knife, slice slightly on the diagonal.